This is the first of a two part series on DNA as evidence for the existence of a creator. See part 2. One common objection by atheists against the existence of God is the lack of any scientific evidence to support the claim. There are many scientific and philosophical claims that have been suggested to support the existence of a creator including the cosmological argument, Swinburne’s argument from temporal order, the origin of the universe, the fine-tuning argument, the moral argument, the argument from consciousness, and others. These have their supporters and detractors. Among some of the more promising is the DNA-as-software argument for the existence of a creator. In this post and the next I will be arguing the affirmative position. I recently ran across this article by Bob Seidensticker, member of the Seattle Atheists and author of “Cross Examined: An unconventional spiritual journey,” where he argued for the negative position. While his readers, judging from the comments, are apparently convinced, I found the arguments to be weak and at times condescending. Evidence for God should not be discarded due to poor arguments. In part 1, I’m going to start towards discussing the end of his argument. There Mr. Seidensticker makes some fundamental mistakes about information in his attempt to refute the DNA-as-software analogy. In part 2, I’ll discuss the more specific objections to treating DNA as designed rather than natural and why the analogy of software is a good one. One of the most stunning finds with DNA is that it encodes information. The information looks a lot like the machine code of human-produced computer software. Since human software bears all the hallmarks of human design, so too does DNA. This suggests, therefore, that DNA is designed and where there is a design there is a designer. The most important objection to DNA-as-software is the claim that there is nothing special about the information in DNA. If this can be shown then the argument reduces to a much less powerful probability argument. As such, it is unsurprising that Mr. Seidensticker makes this compelling objection. First, if, according to the DNA-as-software argument, DNA is designed, then every physical brain is a result of that design. Thus, logically speaking, only things that are designed (brains) can potentially produce intelligence or language (see below). The lack of any example of intelligence coming from anything other than a physical brain is proof for the affirmative not the negative. Additionally, the argument is circular reasoning because one must first assume that natural physical brains are not designed in order for them being natural to be proof for the negative. Informally, it’s a very strange argument that intelligence coming from a brain is proof of the negative when no theist would ever deny this. It seems a little condescending to assume that theists failed to notice such an obvious negative proof. Second, DNA is not just information, it is encoded information. A code, in this context, is a system of symbols that represent of some other (decoded) information. Examples of codes include words in a language. The word ‘Orange’ is an encoding that represents a particular color or a delicious fruit. We decode language when we read or hear it. For example, the Egyptian hieroglyphic language was decoded (or deciphered) only after the discovery of the Rosetta Stone, yet we recognized that it was a language long before we understood it. DNA is a highly complex coded language that contains encoded information. 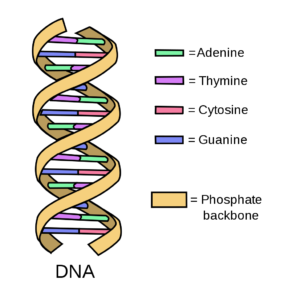 The “words” in DNA represent instructions on what the cell should build. In this way they are much like computer software instructions that tell the computer what to do. While one can describe language symbols using mathematics and geometry (e.g. rendering of computer fonts), the symbols themselves bear no meaningful information on their own. Only when combined according to language rules do they contain meaningful information. First, the key words here are “we” and “us.” The apparent ‘information’ in these examples is illusory. The information is derived or deduced from reasoning inside a physical brain, it is not encoded, independent information. It has no existence outside that produced by intelligence. This is not the case with DNA. A single-celled organism, without a brain at all, contains encoded information in its DNA critical to its existence. Second, coded languages (DNA and brain-produced) and natural patterns (e.g. sea shells, sedimentary layers, tree rings, etc.) are not the same class. While nature can produce many patterns, it cannot produce symbols, especially digital symbols (see part 2). DNA involves many natural patterns, including its transmission, composition and structure, but the digital data it encodes involves a different class of higher-level patterns: syntax and lexical semantics. Outside of DNA, these types of patterns are exclusively in the realm of intelligence and design. While fractal mathematics can explain the shape of a sea shell, the science of natural forces alone cannot explain language syntax and semantics. Third, starlight does not encode information. We can describe and interpret the starlight to learn things, but that’s not the same as an encoding. We wouldn’t be able to draw the same conclusions from an artificial light source emitting those same frequencies because context matters for these patterns. Human languages and DNA-as-software are not like this. If we put the DNA sequences in a computer, removed from its context, we’d still be able to recognize it as a language, even if we didn’t understand it. If we transmitted the DNA code to a galaxy far away, any aliens with our level of intelligence that received it, knowing nothing of DNA or its function, would recognize it as a language and a sign of intelligent life. The atheist may not like that “apologists” are comfortable, but that’s not an argument. Feelings don’t matter. No evidence? The theist has evidence to support the God hypothesis from a variety of fields of study (including science, philosophy, and history). If there is a God, traditionally described as having no precedent, it is no surprise that things with no precedent would be found. The atheist, however, cannot so easily explain away the existence of things without precedent. Drop the software and you don’t have the information creation. You can’t have one (creation of new information) without the other (created by intelligence). This is analogous to those who alter DNA to add new information claiming that because a human could do it, then there is a good chance that nature could do it without intelligence as well. While I’ll certainly admit that this is an interesting thought experiment and that science may one day be able to find more convincing evidence one way or another, reaching such a conclusion now is not possible. While the argument is known by other names, I prefer DNA-as-software for its clarity. Considering that his favorite atheist-related website is the skeptics annotated bible, a work riddled with logical problems, fallacies, and bias, it’s quite possible that he’s not the best choice to rebut the DNA-as-software argument for God. Take that into due consideration. That said, he’s been taken seriously by William Lane Craig. As far as I can tell, the argument is really that if a brain is not explicitly and directly designed, then intelligence cannot be the result of design. Since DNA encodes everything required to produce a brain, and thus intelligence, this seems like a highly implausible argument. Perhaps a more formal argument will be presented in the future that changes this assessment. If an inch of rain falls into a rain gauge, that rain does not contain information, neither does the gauge. The information, that an inch of rain has fallen during some time period, is ‘produced’ by intelligence, by the production of a mind. Similarly, we can tell the age of a tree by counting the number of tree rings. This is, I think, a more relevant post. In it, I argue that DNA, far from being strong evidence for design, defeats the Design Argument. More relevant? Ha! I refuted most of those points in this two part series. I see nothing in that article that is critical regarding evidence for God. As an aside, if your goal is to link spam to promote your site, good luck with that. I’m a remarkably unpopular author and your links are “nofollow”. You’re wasting your time here if your goal is anything other than genuine intellectual conversation.